Home/Page One/Jehovah’s Day is Near! What is the day of Jehovah or Jehovah’s day, as it is alternatively worded in the New World Translation? Jehovah’s day is not a mere 24-hour day. It is the period of time during which God expresses his long-restrained anger – beginning with his own house first, as the Scriptures indicate in several places, and concluding with the entire wicked civilization being wiped off the earth and the beginning of the new world. Jehovah’s day coincides with the interval variously termed in the Bible as the conclusion of the system of things, the time of the end, the final part of the days, as well as the last days. The day of Jehovah is also referred to as the day of the Lord and the Lord’s day. That is appropriate in view of the fact that Christ Jesus stated that the Father has committed all judging to him. So that is why Jehovah’s day is also called the day of the Lord Jesus, since Christ will carry out all of Jehovah’s judgments. While Jehovah’s day is characterized as an awesome display of divine power, according to the Scriptures extraordinary events on earth will serve as a precursor to that great day. What events? As many people who are not even Bible-oriented are anticipating, an unprecedented calamity seems certain to overtake this world in the near future. 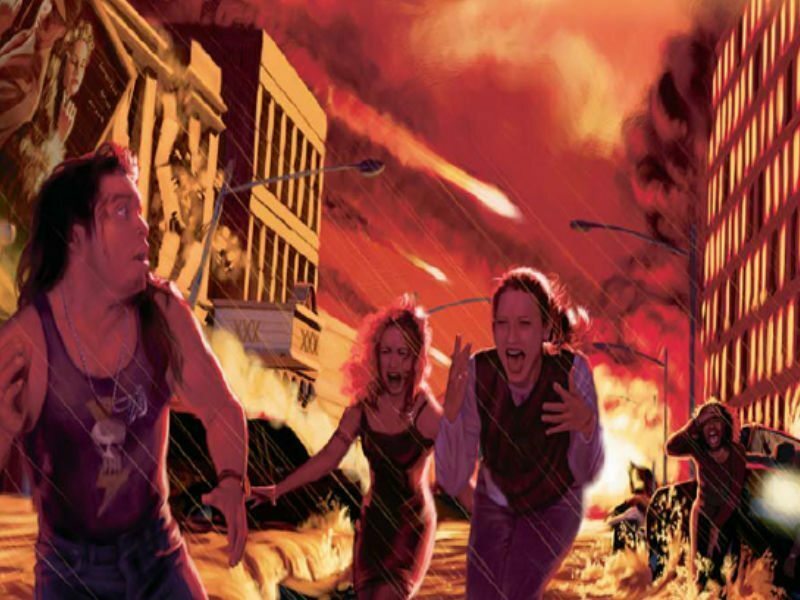 War, financial collapse, famine and pestilence – in short, the four horsemen of the Apocalypse, which is vividly portrayed in the prophecy of Joel, wherein three references are made to the day of Jehovah. There is nothing in the history of ancient Judah or Jerusalem that could even be considered as a typical fulfillment of the prophecy of Joel. However, on the day of Pentecost, when the holy spirit was poured out as Christ had foretold, the apostle Peter was inspired to attribute that outpouring and tongues-speaking phenomenon to the fulfillment of Joel. Interestingly, however, although the prophecy of Joel does not explicitly say it, Peter stated that the prophecy was being fulfilled in the last days. And indeed, the Jewish system entered into their last days once Christ announced woe upon the city and its temple during his final visit to Jerusalem. Discerning readers will take note of the fact that Jesus also used similar phraseology, such as the sun, moon and stars going dark, regarding the events to occur during the conclusion of the global system of things and the desolation of the holy place and that which is represented by Jerusalem of old. Clearly, the “Jerusalem” referenced in Joel is that which is related to Christ’s congregation. Contrary to the Watchtower Society’s assertion that Jehovah’s Witnesses are presently doing the work of the symbolic locust, caterpillar and cockroach armies of Joel, any sober reading of the prophecy reveals that it is God’s special property that is destined to be devoured and trampled on by the nations; the nations being symbolized in Joel as God’s great military force – the “strangers” –who “will no more pass through her,” for the reason that they will be annihilated. What is Jehovah’s military camp? As already stated, it simply cannot be Jehovah’s Witnesses. And it is not Jehovah’s legions of mighty, heavenly angels. That which is spoken of as Jehovah’s military force are those anti-God, earthly armies of all the nations, armed with nuclear, biological, chemical, laser and conventional weapons without number, which Jehovah will merely acquisition to accomplish his own purpose. And once his purpose has been accomplished, then Jehovah disposes of his military force. That will then conclude the day of Jehovah. But even though God sanctions the attack upon his people, as portrayed in the prophecy of Joel, Habakkuk also depicts God becoming directly involved in response to the assault, resulting in the attackers being vanquished. That, of course, did not happen in the actual Chaldean campaign against Jerusalem. The prophecy of Zephaniah similarly situates Babylon’s conquest of Judea as occurring during the day of Jehovah. In fact, the expression “the day of Jehovah” is used seven times in the brief prophecy of Zephaniah. As an indication that Jehovah’s day encompasses more than what occurred in connection with the apostate Jewish kingdom in ancient times, the prophecy speaks to all the meek ones of the earth, those “who have practiced His own judicial decision” – holding out to them the opportunity of surviving that terrible day. In other words, the prophecy pertains to the potential great crowd of hopeful Jehovah’s Witnesses. Similarly today, a Governing Body composed of Spirit anointed Christians contributes to the unity of the worldwide congregation. The Governing Body publishes spiritually encouraging literature in many languages. This spiritual food is based on God’s word. Thus, what is taught is not from men but from God. It is true, the Governing Body publishes encouraging literature in many languages. And most of what the Watchtower teaches is based on God’s word. However, the same issue of the Watchtower goes on to regurgitate the well-worn message of how Christ began ruling in his kingdom in 1914 and how Jesus declared the Watchtower Society to be his clean instrument back in 1919. But since it can be Scripturally proven that the Society’s 1914 doctrine is false, obviously that is not a teaching from God. That means that the Governing Body is practicing a massive deception – wittingly or unknowingly does not matter. The Governing Body and their predecessors have most certainly envisioned what is untrue regarding the parousia of Christ having already commenced. And now in 2010, just four years shy of a century since Jesus supposedly returned invisibly, the Watchtower Society is still waiting to “have a word come true.” So far not one of their prophetic utterances has. Over the past century the Watchtower has issued many verbal messages and authored countless written statements, authoritatively announcing both “the presence of our Lord Jesus Christ” and that “the day of Jehovah is here.” Ironically, that, coupled with the reality of the Society’s own apostasy, indicates that the day of Jehovah is about to erupt. Jehovah’s Witnesses fit the description of those who are “craving the day of Jehovah,” primarily because the Watchtower Society has misled them to expect to be idle bystanders to the unveiling of Jehovah’s judgments. But as regards the prophecy Paul uttered some 2,000 years ago, who is the “they” who will be saying “peace and security,” which will then serve as the authentic signal that the presence of Christ and the day of Jehovah are finally here? Although the Hebrew prophecies indicate that the leaders of the Jews falsely claimed there was peace between God and his people – that does not seem to have any connection to the prophecy in question. First, it should not be supposed that the “sudden destruction” that is destined to instantly come upon “them” is the ultimate destruction of the nations at the world-ending war of Armageddon. Considering that the day of Jehovah will rock all the nations and throw them into a violent tumult, from which the anguished and terrified peoples of the world will see no way out, apparently the “they” who are prophesied to be “saying peace and security” are the present leaders of the world – more probably the leaders of the Anglo-American superpower – the champions of freedom and democracy. This may, perhaps, be manifest in the coming months in some sort of “solution” to the long-standing problems in the Middle East regarding Iran’s nuclear ambitions and the Israeli and Palestinian situation. In any case, the destruction that comes upon those who are “saying peace and security” will most certainly be the destruction of the nation-state political arrangement, along with the already collapsing global financial system. Their destruction will give way to the imposition of a short-lived, genocidal global government, administered through the United Nations – the neo-Chaldean tyrant, who then will carry out heaven’s judgments during the desperate day of Jehovah.